This individual came into our Newport Beach dentist office with a broken off lateral incisor at the gumline. This tooth was crowned along with the other front teeth after trauma about ten years before. The front left(patient left) tooth was removed. 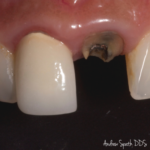 Upon removal an immediate implant and gum graft was performed. She was then fitted for a custom, lab fabricated temporary. 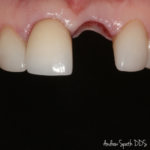 Three month later we placed four new crowns and a custom titanium implant abutment. As with all of out patients we always make sure that in the temporary phase the esthetics are of the highest level and no patient is without a tooth in the smile zone that does not meet their standards.